After Tuesday’s election, many of us were left reeling. I spent much of Wednesday fighting back tears as I tried to concentrate on something other than the shocking results. 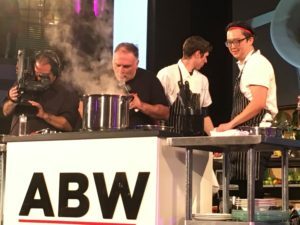 And it was still with a heavy heart that I trudged downtown on Thursday night to the Ronald Reagan Building for the Capital Food Fight to benefit DC Central Kitchen. It didn’t take long for the fog to lift (at least temporarily) as I witnessed DC’s wonderful food community come together for a great cause. DC Central Kitchen addresses hunger and poverty by preparing unemployed adults for culinary careers, transforming wasted food into nutritious meals for homeless shelters and nonprofits, serving award-winning farm-to-school menus to low-income schoolchildren, and delivering fresh produce and healthy snacks to corner stores in DC’s food deserts. 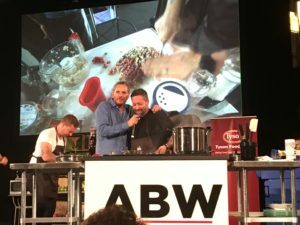 Most inspiring was the attitude of event founder José Andrés (Chef/Owner, ThinkFoodGroup, who despite his ongoing legal battle with the new president-elect, was in good spirits. His laser focus on fundraising helped the event raise $694,000. Presented by Tyson, the Capital Food Fight brought together over 1,200 guests, 75 tasting restaurants, as well as cocktail mixologists and live on-stage cooking competition. It was impossible to visit every station, and I missed some notable ones. I focused on some of the restaurants I’ve yet to visit, which led me to one of my favorite bites: braised octopus with fingerling potato, chorizo, olive and fresno chili sauce from Chef Kyoo Eom of Dirty Habit. HipCityVeg offered up a crispy chick’n slider with broccoli rabe and quajillo aioli, which I gobbled up. 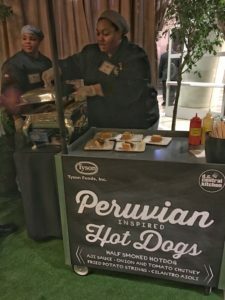 Since I just returned from vacation in Peru, I was happy to indulge in Peruvian inspired hot dogs with onion and tomato chutney, fried potato strings, and cilantro aioli, presented by students from DC Central Kitchen. 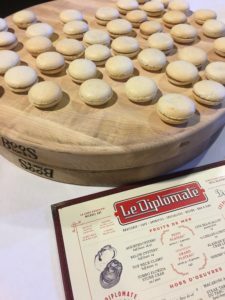 I followed up with a delectable foie gras macaron from Le Diplomate, a wonderful blend of sweet and savory. 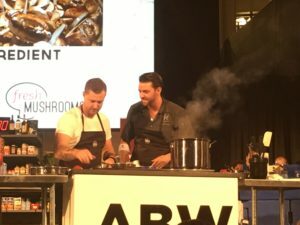 Event-goers were treated to a spontaneous food fight between DC’s “Top Chef” contenders Bryan Voltaggio, Jen Carroll, Mike Isabella, George Pagonis, and Marjorie Meek-Bradley. LA Top Chef Michael Voltaggio, who participated in the event as a judge, jumped into the ring as well. Another former “Top Chef,” Spike Mendolsohn, participated as a co-host. Who won the main event? 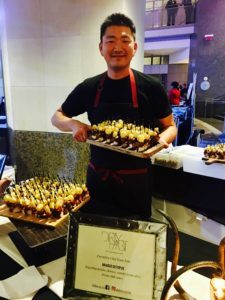 Chef Samuel Kim of 1789 restaurant was the victor in the final round with his curried popcorn grits with pan-seared shrimp. DC food writer Nevin Martell eloquently captures the event in his piece for Washington City Paper, “The Elephant in the Room at Last Night’s Food Fight.” As a DC food blogger, I am grateful for the opportunity to attend events like the Capital Food Fight, where we can help support and empower those in need. 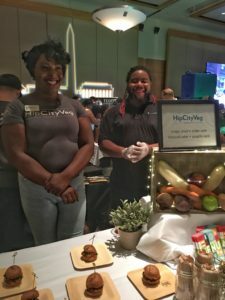 Capital Food Fight raised $694,000 for DC Central Kitchen, which earns 60 percent of its $13 million annual budget through social enterprise ventures that employ at-risk adults to serve healthy food in DC. The remaining 40 percent is secured through charitable fundraising like the Capital Food Fight. DC Central Kitchen has won national recognition for its scratch-cooked, locally sourced meals for DC schools. 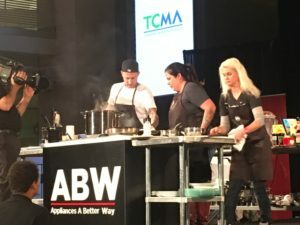 In all, the organization serves more than 3 million meals to schools, homeless shelters, and partner nonprofits each year, and helps nearly 100 culinary students trade incarceration, addiction, and homelessness for culinary careers annually.